Real Madrid earned a hard-fought 2-0 win at home to Sevilla in a heavyweight La Liga clash on Saturday, inspired by a stunning late strike from Casemiro. Both goalkeepers were busy in the early exchanges of the match, with Sevilla's Tomas Vaclik forced to deny a strong low effort from the lively Vinicius Junior just six minutes in, before Andre Silva drew a save from Madrid's Thibaut Courtois with a 25th-minute headed effort in the box. Sergio Escudero also fired wide of the near post after running clear through on the home side's goal, as both sides failed to capitalise on their attacking openings in the first half. A lively start to the second half continued to fail to produce a goal, though Luka Modric produced a powerful strike which nearly gave ​Madrid the lead just ahead of the hour mark, but the Croatian's effort was well blocked in the Sevilla box. 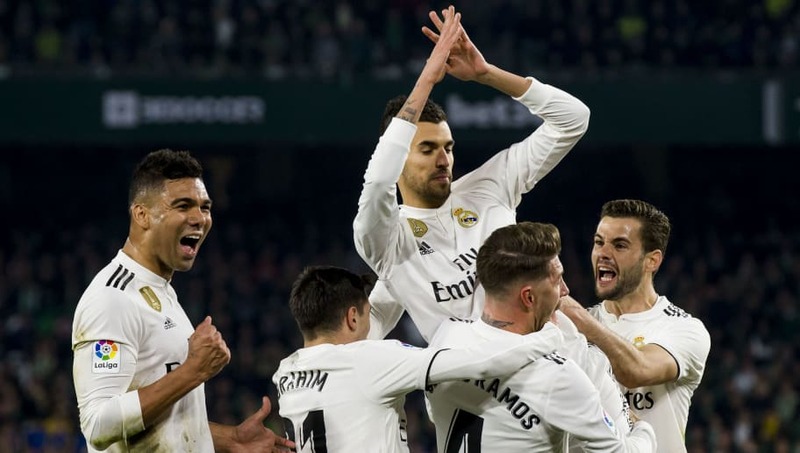 The impressive Dani Ceballos went closest when he hit the bar for Madrid with a stunning long-range effort, before fellow midfielder Casemiro planted a strong header just wide of the far post with the final 15 minutes approaching. Madrid appeared to be on course for another disappointing result, despite having enjoyed clear dominance in the match, before Casemiro unleashed a ferocious drive from long range which whistled past Vaclik to hand Los Blancos a deserved lead on the 78th minute. Luka Modric then capped off a typically influential midfield display as he doubled Madrid's lead in stoppage time as the Croatian nipped the ball away from Sevilla's defence and went through on goal to slot home and seal the home side's hard-fought victory. Real Madrid's recent blight of injury troubles has cost them the chance to build any real technical consistency or stability in Santiago Solari's struggling side. Dani Ceballos's presence felt defensively here. Sprints back to cover for Ramos, wins the ball, and then blocks a cross to force a corner. Nice applause from Bernabeu. With the likes of ​Gareth Bale, ​Marco Asensio, ​Toni Kroos and Marcos Llorente all remaining sidelined for Saturday's game, Los Blancos were clearly lacking the kind of fluidity and telling quality in their attacking play throughout the game which is expected by their lofty standards. Those shortcomings are largely down to a lack of consistency in Solari's team selection, with the former Madrid winger forced to adjust his plans in accordance with his side's growing injury troubles. Two individual moments of sheer quality won the match for Los Blancos late on. Starting XI: Courtois (6); Carvajal (6), Varane (6), Ramos (6), Reguilon (6); Modric (7), Casemiro (6), Ceballos (7); Vazquez (6), Benzema (6), V.Junior (7*). STAR MAN - As has been the case on multiple occasions in recent weeks, Vinicius Junior was the most effective outlet in leading Los Blancos' goal-shy attack on Saturday. The Brazilian youngster was another fitness doubt ahead of the game, but earned his place in Madrid's front line once more with another lively display. The 18-year-old was once again the most efficient passer and most consistent attacking threat among his side's forwards. WORST PLAYER - Lucas Vazquez provided plenty of work rate but offered little in the way of genuine attacking threat on Madrid's right wing at the Bernabeu, as Madrid continue to miss the star quality of Gareth Bale and Marco Asensio through injuries. Starting XI: Vaclik (6); Navas (7), Carrico (5), Kjaer (5), Gomez (6), Escudero (6); Sarabia (6), Banega (6), Vazquez (7); Ben Yedder (6), Silva (6). Real Madrid host Girona in the first leg of a Copa del Rey quarter final clash at the Bernabeu on Thursday. Solari's side then travel to face Espanyol in their next La Liga outing next Sunday.